It was a small journey getting to the point of completion but it was worth it and it wasn't all that hard. If you want to make one here are a few things you need. I see them everywhere and now maybe you will too. You can also purchase them new & clean at a variety of places. See our original post here. Pine, treated wood, or better yet cedar would be ideal (just a bit more expensive). We took a 2x4 from my brother in law. Measure to desired arm rest height and cut with a miter saw. Secure to top sides of pallet. View that post here. If you don't have one, I'm sure you may know someone who does! It will make the sanding of the pallet so much easier and faster. Once sanded (with a grit of 60-80) stain 2 coats then sand again using a grit of 120-220 the later being super smooth and what I used. Stain again if necessary. Seal with Thompson's water seal. The bigger the better I think. We had these smaller ones kicking around in the garage so we went with them. You will need five. One in the middle and four for each corner. We were lucky enough to get a foam single mattress from a friend. Thank God! Go foam if you can. Call around or ask on FaceBook if someone is getting rid of one. Chances are someone is. You can also look on Kijiji. It's only an outside daybed so it doesn't need to be new. 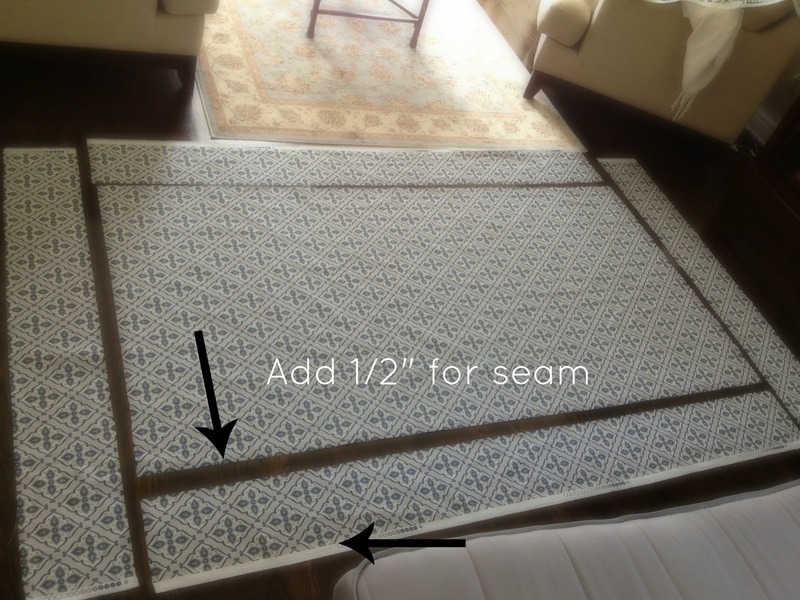 This is the ideal choice especially if you are going to sew a daybed slipcover. See below for detailed instructions. I bought 2 cushions from HomeSense and a few from Maxi. 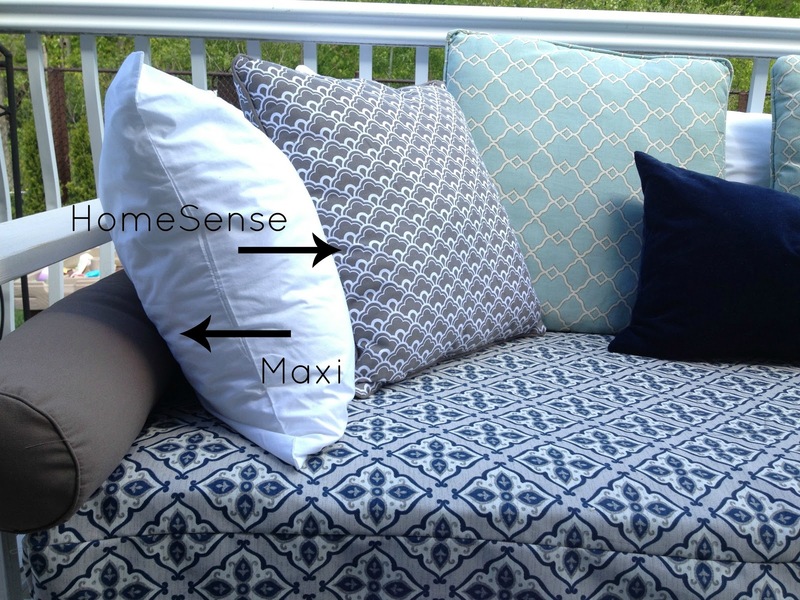 The light blue and navy pillows I already had in the house. The light was from the Winners and navy one from Ikea. 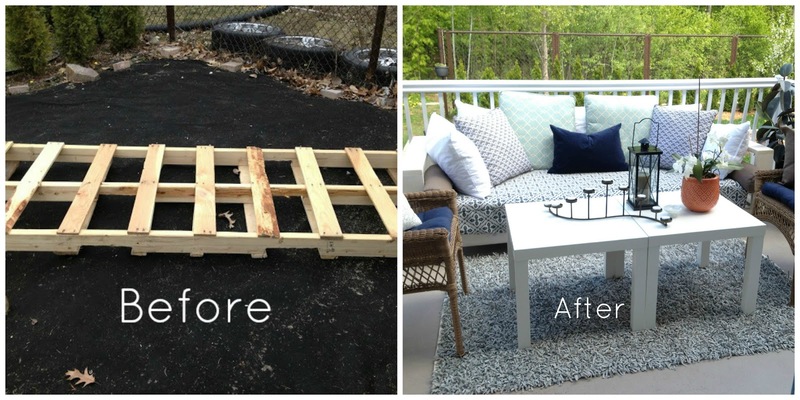 This is were I originally got the amazing idea to make the daybed from Prudent Baby. She lives in California so she didn't really need to use an outdoor fabric. She simply used a fitted mattress sheet. You can absolutely do the same thing and put a waterproof mattress shield underneath it. Done. I had the brilliant idea of making one instead. 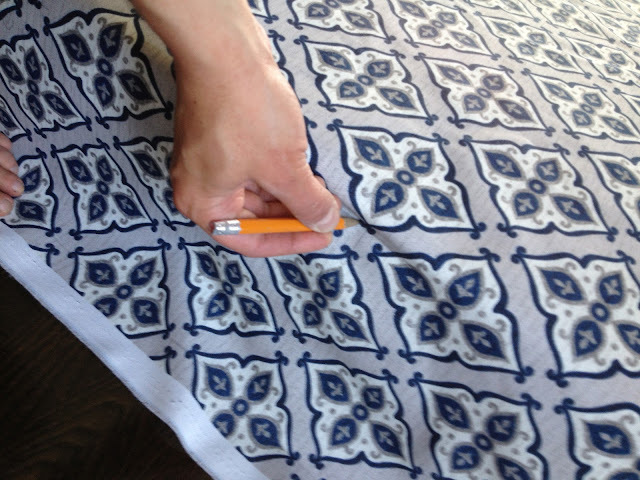 The single mattress measured 33x78x8 so I bought 3 metres of the Moroccan inspired print for the top and sides and 3 metres of a solid navy for the bottom. I had about 1/2 a metre leftover of each, perfect to make a couple cushion covers. Iron fabric and set atop your mattress. I wanted to make sure I got the measurements right so I did it this too. Have a pencil, tape measurer, paper and good fabric scissors on hand. Though I was going to measure it anyway I wanted to have a guideline of where I needed to measure the 1/2" seam from when I would sew the pieces together. So I traced a line all around the bed. This was a "double checking" method for me. I measured a 1/2"seam all the way around and had to take into account another 1/2" seam for the bottom piece I would later sew on. So 1/2" extra material around every rectangle. Then cut and pin together right sides facing in. Final measurements were 34x79 and 9x(by the length of that side). Sew all four sides to the top making sure you backstitch all of your corners so they do not become undone. Then place on top of your mattress to ensure a good fit. I felt like a dress maker doing this. Turn inside out (right side facing the mattress) and pin all four corners. Then sew shut. I then cut the length of one smaller side for the zipper opening. Installing a zipper is really easy. You tube has some great 2 minute tutorials. Any zipper style will do so find one that you think is the easiest. I did a concealed zipper closure. Leaving the zipper opened after I sewed it on, I sewed the navy blue bottom to all four sides. Then turn outside in. Done. Note: Though the zipper enclosure I made was the length of the side of the mattress it was really hard to get in. Thankfully it went in smoothly with the foam mattress because foam can be squeezed. It would not get into a regular mattress. I tried. 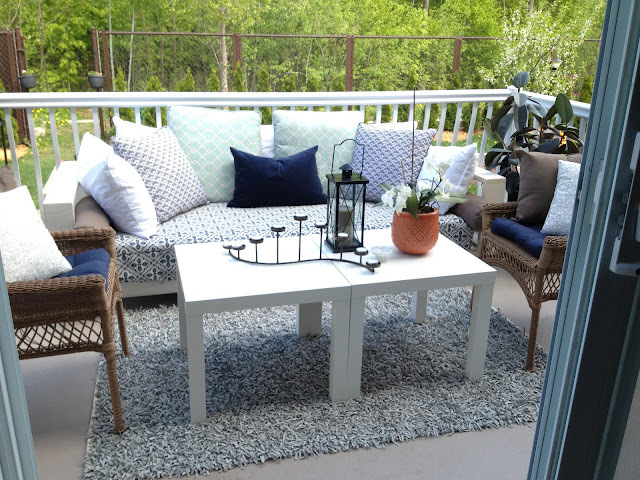 Don't forget to purchase an outdoor couch cover. I still need to do this. I hear Walmart and Canadian Tire have some. It's on my weekend to do list! Hopefully with some warm weather I can enjoy this over the long weekend. If you have any questions feel free to ask me in the comments section just below.